Freddie Spencer, Eddie Lawson, Mick Doohan, Wayne Gardner. Four crème de la crème motorcycle racers! And they each grappled with the Honda NSR500, at some point in their careers. 'Grappled with ... '? Well, the NSR500 was never the best-handling of bikes. Its one-of-a-kind V-4 motor, though, more than made up for its deficiencies through the twisty bits. Numerous race wins - and, indeed, world championships - are testament to that! The NSR500's staggering straight-line speed was never in doubt. Shinichi Itoh - on an NSR - was the first rider to top 200mph. That was at Hockenheim, in 1993. Mind you, Itoh had a neck-wrenching 185bhp at his disposal! Such stats were eclipsed only by the bike's success rate. By the time Valentino Rossi signed off the two-stroke era - on an NSR, in 2001 - it had won 10 titles in 18 years! Mick Doohan took 5 of them - on the spin! And in 1985, 'Fast Freddie' Spencer won the 500 and 250cc championships - both on NSRs! 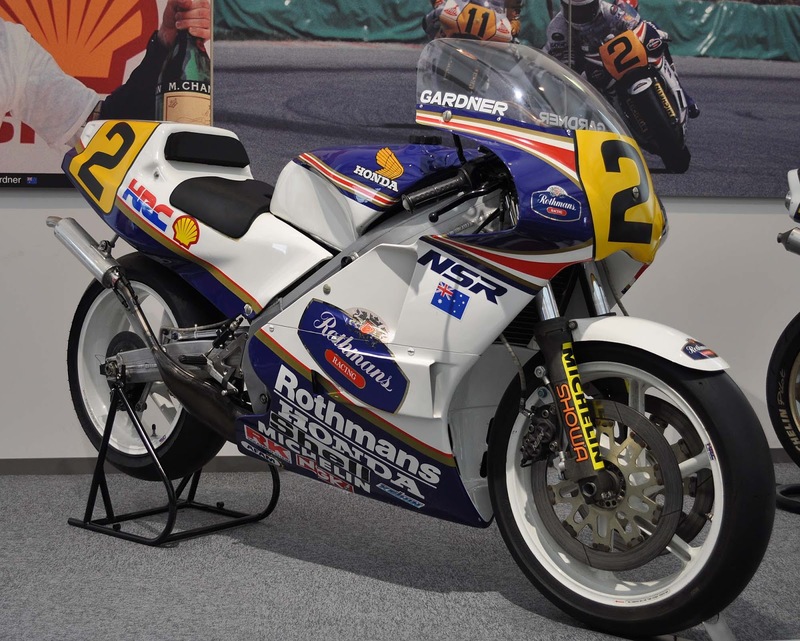 The Rothmans Honda's looks matched its performance. While tobacco sponsorship has, understandably, fallen from favour, there is no denying it inspired some superb paint-jobs, in its time. And the NSR's was among the most lustrous of all. A satisfying blend of hues and graphics, you might say! A true legend of the race-track, the NSR 500 has to be one of the best bikes the 'Honda Racing Corporation' has ever built!